Allium sativum, better known as garlic, may have the fictitious ability to keep vampires away but it has benefits that far surpass the imagination of writers of the horror genre. The cloves of the garlic bulb are used as a culinary ingredient to whip up tantalising dishes in the cuisine of many countries, including India, Italy and others. Its use goes back to the Ancient Egyptian civilisation. The perennial plant, which grows well in mild climates, is touted for its medicinal properties as well. The chemical allicin is responsible for the strong odour of garlic. Aged, odourless garlic extract is used as a supplement instead of fresh garlic which, when consumed directly, can cause indigestion, halitosis and body odour. Garlic is said to lessen the hardening of arteries or arteriosclerosis as a natural process of aging. It has been linked to reducing the risk of colon and rectal cancer. Garlic supplements are taken to reduce high blood pressure. A disulphide in garlic called ajoene may be responsible for preventing blocks from occurring in blood vessels. Garlic can strengthen the immune system and reduce the effects of cold and to some extent prevent it. The antioxidants in garlic combat the effects of aging, thus reducing the liability of dementia. Avoid medicinal doses of garlic if undergoing an operation because its anti-clotting property can increase bleeding. 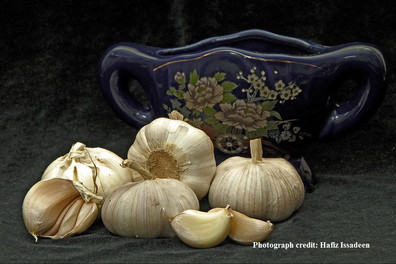 People suffering from low blood pressure are cautioned to use garlic as medicine very sparingly. Ingredients: ½ kg of mutton, 10 red chillies, 1tbsp of coriander seeds, 1 inch cinnamon, 5 peppercorns, 5 cloves, ¼ tsp of mace powder, ¼ piece of nutmeg, ½ tsp of cumin seeds, 1 cardamom, 100gm green coriander, 20-25 flakes of garlic, 2 inch piece of ginger, ¼ tsp of turmeric powder, 1 tsp of lime/lemon juice, 3-4 cups of grated coconut, 2 onions, 1 tsp of poppy seeds, 1 tomato and salt to taste. Preparation: Prepare green masala by combining the paste of coriander, garlic, ginger, turmeric powder, chillies, and lime/lemon juice. Apply it to the mutton pieces and keep it aside for 10 minutes. Roast red chillies, coriander seeds, cinnamon, black pepper, cloves, mace powder, nutmeg powder, cumin seeds, cardamom and poppy seeds. Chop an onion finely and fry the onion with the grated coconut in a little oil. Then prepare a paste of coconut, onion, and the above roasted mixture of spices. Fry a chopped onion and a chopped tomato in a non-stick deep frying pan. Add mutton, salt and water and cook it well. When it is cooked add the combined fried coconut, onion, roasted mixture, and water if required. Cook it for 5-10 minutes. Ingredients: ½ kg cleaned crabs, 2 onions, 1 tomato, 2 tbsp of coriander seeds, 5 cloves, ½ tsp of black peppercorn powder, 2 cups of grated coconut, 2 cardamom pods, ½ inch cinnamon, 1 tsp chilli powder, ¼ tsp nutmeg powder, ½ tsp fennel seeds, ½ inch of ginger and salt to taste. Preparation: Roast coriander seeds, cloves, black pepper powder, cardamom, cinnamon, chilli powder, nutmeg powder, fennel seeds. Then make a paste of the roasted spices. Cut onions and tomato finely and fry in a pan with edible oil. Add ginger paste, crabs (remove the outer shell), salt and water and cook well. Keep required water and add the paste prepared earlier and cook for 5-10 minutes more. Sore throat: A mixture of 1 tsp of pepper powder, 1 tsp of honey and 1 tsp ginger powder taken twice a day will work wonders for a sore throat. Low blood pressure: Soak 6-8 almonds for about 8 hours. Then peel and grind them. Boil the paste in a glass of milk and drink warm.